A bizarre sequence came to the cosmically correct ending in the Chargers-Ravens game. Refs and replay officials arguably blew at least four separate calls at the 1-yard-line before the Chargers finally punched it in for a 20-3 lead. On the first play, Chargers fullback Derek Watt rolled into the end zone but was ruled down. It seemed clear on replay that the play should have been reversed to a touchdown, but the call stood. Then the ball was spotted at least two feet short of where it should have been, triggering an even stranger series. 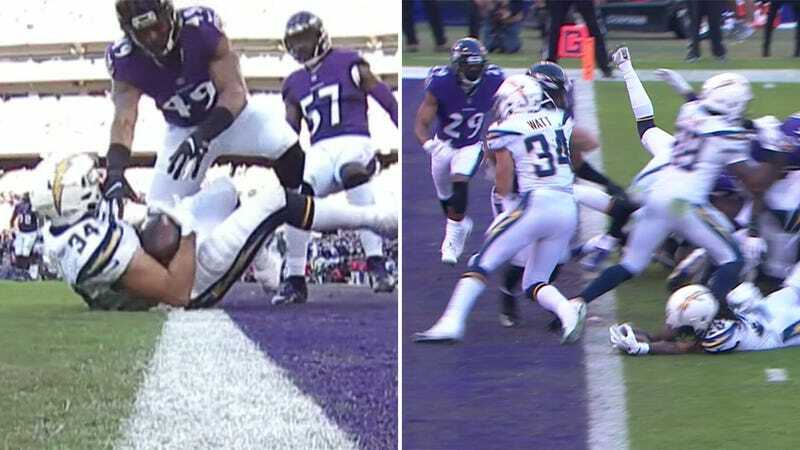 As Melvin Gordon lunged for the end zone, he lost his grip on the ball, and Ravens corner Marlon Humphrey scooped it up and returned it for a touchdown. But officials had blown the play dead, ruling out the possibility of a touchdown. But the officials reversed the touchdown and ruled that Gordon was down but had maintained possession. They then again spotted the ball too far from the end zone, but the Chargers scored on the next play anyway.